Cyclists in the City: MP implies people who use a bicycle to get to work 'not essential to the economy'. 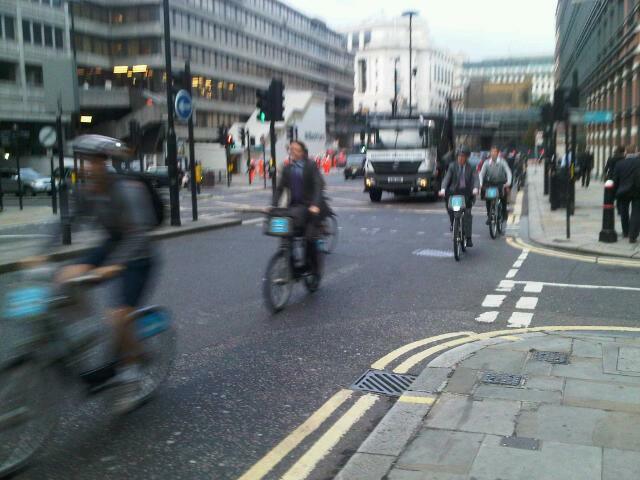 Here's an update on how MPs are responding to The Times's 'cities fit for cycling' campaign. Flashride to Parliament Wednesday night. Join in. MP implies people who use a bicycle to get to work 'not essential to the economy'. Here's an update on how MPs are responding to The Times's 'cities fit for cycling' campaign. Flashride to Parliament Wednesday night. Join in. 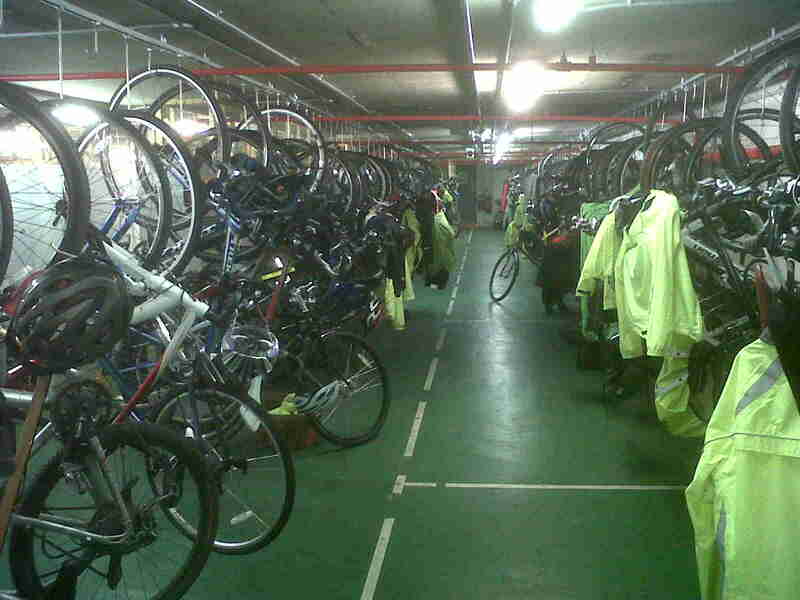 I put it to Angie Bray MP that the people parking their bicycles in this office in the City of London are just as 'essential to the economy' as the people driving motor vehicles on London's roads. I'm not sure she realises that. Last night I posted details of the many MPs who have responded to their constituents asking them to support The Times's #cyclesafe campaign and to make our cities fit for anyone to cycle in. You can see what your MP has to say if you live in Southwark, Lambeth, Westminster, the City or in the Prime Minister's constituency by looking here. A number of Conservative MPs have sent a cut and paste response which you can see on this link here. However, Andrew Jones (Con) MP for Harrogate and PPS to Justine Greening has confirmed he will attend the debate and has indicated support for making our cities places where people can cycle as a matter of habit. "@AngieBrayMP I certainly back safer cycling and segregated lanes surely help.But roadspace has to be shared so not always easy on busy roads"
"@AngieBrayMP I think the change in numbers probably marginal and it is mainly commercial traffic which is of course essential to the economy." "@AngieBrayMP yes of course but we have to find a way of protecting the vulnerable while accommodating what is necessary." "@AngieBrayMP they are carrying goods/tools/supplies etc which clearly can't fit on a bike"
Good that she sees the point of safe space to cycle. Bad that she doesn't realise the lack of this safe space is why the 'change in numbers probably marginal'. Equally bad that she doesn't understand someone on a bicycle might be just as 'essential to the economy' as someone driving. I'm building a list of MPs who have failed to respond to constituents. If yours is ignoring the cyclesafe motion, please let me know and I'll add them to the list. Joan Ruddock (Lab), Lewisham & Deptford - Has since responded with a positive message. Angie Bray (Con) Central Ealing & Acton and Richard Ottaway (Con) Croydon South - neither has responded to constituents directly but both have signed up to the template letter you can see here. Meanwhile, if you regularly use the incredibly popular, segregated cycle track that runs east-west through Bloomsbury, you might like to see how Frank Dobson MP tried very hard indeed to prevent that cycle track from being built in the first place by reading this excellent review here. If your MP is on this list, then write to them before Thursday's debate asking them to attend by clicking here and sending an email directly to them. aren't doing their bit for the economy? You can see how Kate Hoey (Lab) Vauxhall responded here and Mark Field (Con) Cities of London & Westminster here. Emily Thornberry (Lab) Islington South & Finsbury - has been in touch saying she can't participate in Early Day Motions but is inclined to support. The senior Labour team involved in transport has been very clear and come up with a three point plan that contains many of the right issues. You can see those details on a previous post here. Simon Hughes (LibDem) Southwark & Bermondsey has shown real understanding of cycling issues and been a prominent supporter. You can see his latest update on his website here. I've seen positive reports from Zac Goldsmith (Con) Richmond and from Mike Freer (Con), Finchley & Golders Green. Freer's response to a constituent was generally sympathetic and talked about the fact that he cycles to work but contained the magical line that 'the roads are rarely wide enough to carve out a dedicated and segregated cycle lanes'. Firstly, that slightly misses the point. Segregation is one of several tools in the road kit. Also, it's not true. I asked one UK-based Danish diplomat to respond to Freer's email on twitter and this is what she said: "seems unambitious, when comparing LDN w my native CPH then seems there is room on streets & in heads for more #cyclesafety :)"
Exactly right: The 'lack of space on our streets for safe cycling' is actually about the lack of room in our heads. There's plenty of space, we just need to think about our neighbourhoods differently. Mark Lazarowicz, (Labour-Cooperative), Edinburgh North & Leith said: "The potential danger presented by motorists driving at speed in urban areas can put many people off cycling. Cyclists are inherently more vulnerable than motorists and drivers should be more aware of the need of cyclists, especially when they are turning right or at junctions." Jonathan Evans (Welsh Conservatives) Cardiff North: "I welcome the current campaign launched by The Times, which aims to improve safety. However, it is also important to improve through improving the proficiency of cyclists and by enforcing proper compliance with the Highway Code. I am disturbed by evidence that a major number of cyclists routinely ignore traffic lights and pedestrian crossings. I was struck by such a cyclist myself in London recently who told me he did not consider that compliance with lights and pedestrian crossings applied to cyclists. I also believe that it is important to promote the wearing of helmets by cyclists as part of this safety campaign..."
Bring a bike and join our ride to Parliament to ask MPs to make cycling a serious transport choice. Join us Wednesday 22nd February. Meet at the Duke of York steps, The Mall, 6.15pm. More details on ibikelondon blog here and on the London Cycling Campaign page here. You can even register for the ride (but you don't need to) on the Londoners on Bikes website here. I'm also delighted that both Brompton bicycles and Evans Cycles have committed to support the Flashride. It would be lovely to see some other big cycling names get behind the ride as well. It might be worth including a list of those Conservative MPs who simply sent out the pre-scripted fob-off in response to any correspondence. More to add to that list, I'm sure. Anne Main, con, St Albans. Charlotte Leslie (Con) Bristol North West too. Nick Raynsford (Lab) Greenwich & Woolwich. I've just received a two-page reply from Nick Raynsford. Rather a long wait for it (can't remember when I wrote to him, possibly same time as you) but actually a very thorough and considered response. I suppose we shouldn't be surprised that many MPs have eitehr not responded at all, or have provided a fairly negative response albeit dressed up in warm words. Labour and Lib-Dems don't. They're supposed to believe in a more managed society with more protections for the vulnerable. Frank Dobson is quite frankly beneath contempt for his opposition to the Camden cycle track, quite apart from the fact that he has been proved so wrong about it. Kate Hoey likewise - she should get off her hunt-horse and look after the real interests of her constituents in a poor inner-city borough which is blighted by being just a place on a road from Esher to Westminster/City. Here is my MP's reply. Thank you for your email. As a keen cyclist I recognise the dangers that cyclists are exposed to and that put many people off cycling on a regular basis. I have already contacted The Times to pledge my support to their campaign. He does cycle a lot, as I have seen him on his bike a number of times. I wrote to Rushanara Ali MP (Labour, Bethnal Green & Bow) on 2nd Feb asking her support for the Times campaign. Still no response as yet. I wrote further on 16th Feb asking her to support the Commons motion; no response yet, but to be fair it's a bit early for the 2nd letter. I'm disappointed that she hasn't responded to my first letter, though. Three cyclists have been killed in her constituency recently, including the 2 high profiles ones at Bow roundabout. You'd think she would want to reply sharpish, and support. So far zilch. Outside London, I've had a good e-mail discussion with my MP, Michael Ellis (Northampton North, Conservative) over the point in the Campaign about 20 mph zones in residential areas. He's also met with cyclists at his constituency surgery. He won't support every point of The Times' campaign but he hasn't fobbed us off with a "cut and paste" response. I wrote to Jim Fitzpatrick (Lab, Poplar and Limehouse) and got back the following - "I've been supporting and we'll write to you with the latest". Nothing on Gavin Barwell's site ( http://www.gavinbarwell.com/ ). He normally takes a view on most issues and is a keen blogger. Obviously hoping to avoid taking a stance on this one. I got a good and quick reply from Diane Abbott (Shadow Public Health Minister), Hackney North & Stoke Newington. "Jonathan Evans (Welsh Conservatives) Cardiff North: "I welcome the current campaign launched by The Times, which aims to improve safety. However, it is also important to improve through improving the proficiency of cyclists and by enforcing proper compliance with the Highway Code. I am disturbed by evidence that a major number of cyclists routinely ignore traffic lights and pedestrian crossings. I was struck by such a cyclist myself in London recently who told me he did not consider that compliance with lights and pedestrian crossings applied to cyclists. I also believe that it is important to promote the wearing of helmets by cyclists as part of this safety campaign..."
Fair enough cyclists should know that lights effect them, but on the other hand some lights change just far to fast esp when on a uphill to give a cyclist enough time to cross safely. Cyclists should be given priority on lights, often cars just feel cyclists are in the way esp if they had to wait on the lights for a while. Wearing of helmets does NOT make safer cycling! While wearing HI-Viz clothing means cyclists are seen much more easily by other motorists. As someone whose main form of transport around Walthamstow is my bike I welcome this campaign - It is a real concern that the numbers of cyclists being killed or seriously injured is going up and frankly I don't think its good enough for the Road Safety Minister to dismiss as ‘rubbish’ the concerns that his government’s decisions have made our roads less safe for cyclists! There are a number of changes I think are problematic- including the abolition of the grants to improve facilities for cycling and the axing of funding for speed cameras. Furthermore, the decision to end national targets to cut deaths and serious injuries on our roads risks reducing the focus across government to improving safety on our roads and allowing longer HGVs onto our roads has real implications for safety given HGVs are three times as likely to be involved in fatal accidents compared to all other vehicles. A proportion of existing government funding for roads should be sent aside to be spent on building new cycle ways, improving junction design and installing traffic light phasing to give cyclists a head start. The trial of longer HGVs should be axed and income from the proposed HGV road charging scheme used to support the road haulage industry in upgrading safety measures and training. National targets to reduce deaths and serious injuries on Britain’s roads, axed by the government, should be reinstated. However, there is an acknowledgement that we need to go further to develop a detailed set of proposals to improve the safety of cyclists. That's why Labour will be holding a Cycling Summit at Westminster in the coming days to bring together cyclists, cycling organisations along with representative from motoring organisations, road hauliers and road designers to discuss these ideas and what else should form Labour’s approach to cycling and improving safety. Ditto to veryrarelystable, I haven't had a reply from Rushanara Ali either after two weeks. Feeble. I first contacted Justine Greening over two weeks ago - no response (not even an acknowledgement) and have tried twice since, seeing as we're on the eve of the debate. I'm not expecting anything from her. For all his good words Mr. Freer refused to sign the EDM and didn't attend the debate yesterday (according to The Times). I will be writing to him today to find out why. To follow up from my brief reply to Methers above, I did receive quite a thorough reply from Nick Raynsford. Uncannily, there are strong echoes of the phrases in Stella Creasy's response, so clearly there is some sort of pick list of phrases being given out. However, Mr Raynsford did depart from the script to discuss Boris Johnson's lamentable approach to cycling and mentioned the 20 mph limit for Blackfriars Bridge, which apparently Ken will be considering. I was told by a friend who works in the local Labour Party who did say that Mr Raynsford can be a bit slow to respond and doesn't tend to do e-mail!